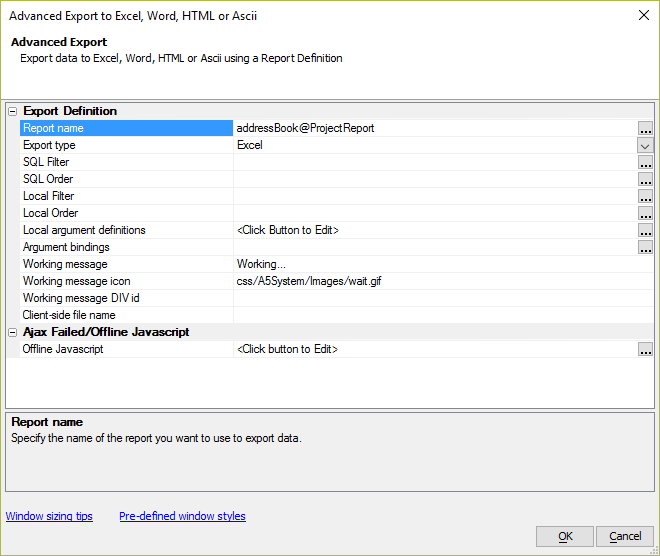 Specify the name of the report you want to use to export data. Specify the type of export file you want to create. Choices include Excel, Word, HTML, Ascii, PDF. Specify if the report should be filtered. (This filter is in addition to any filter that was defined as part of the report layout). Specify the report order. If you specify an order here it will override the order defined in the report layout. Specify if the report should be filtered. This filter must be defined using SQL syntax. It is executed on the Database Server. (This filter is in addition to any filter that was defined as part of the report layout). The local filter is executed after the data is retrieved from the SQL database. This filter must be specified using Xbasic syntax. If possible, you should use a SQL Filter in preference to a Local Filter - it is much more efficient. The local order is applied after the data is retrieved from the SQL database. This order must be specified using Xbasic syntax. Specify the image to show in the window while the window waits for its contents to be generated. Specify the ID of a DIV on the page where the 'working message' will be shown. Specify the default filename on the user's computer (when they download the file). If you leave this blank, the filename of the server will be used as the default client-side filename.